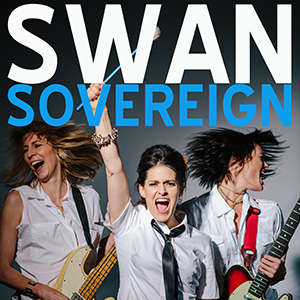 Swan Sovereign is a Portland, Oregon trio with punchy, deviant pop songs and harmonies so buttery that you’ll forget to be offended by the bossy lyrics. Stephanie Schneiderman (drums) Lara Michell (guitar) and Christine McKinley (bass) are a tight, spare unit with compact songs that burst from dead quiet into tantrums and back down. Before taking over the rhythm section and forming the power trio that became Swan Sovereign, the three were in Dirty Martini. The music of Dirty Martini was gloomy, introspective and rain-soaked, like April in Portland. Swan Sovereign is more like a dance party on a sunny day in Antarctica – bright hand blinding, with snowballs flying and a bit of blood on the ice from playing too rough. Swan Sovereign’s songs about interrogation, family secrets, and organized rebellion cut clean and deep. Then they rub salt in with mean 60s girl group harmonies leaving listeners with a pretty pink scar.